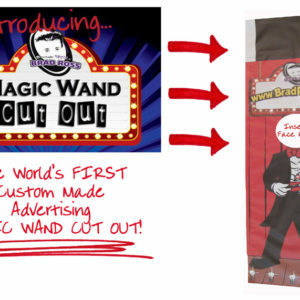 The giant magic dollar is the most effective give-away of all time for kids & family shows. Why wouldn’t they be? They are cheap to produce,they look great and kids really want them!On top of that, kids keep them forever so they can remember how to do the tricks on the back! The giant magic dollar is the most effective kidshow give-away of all time.Why wouldn’t they be? They are cheap to produce, they look great and kids really want them!On top of that, kids keep them forever so they can remember how to do the tricks on the back! The best part is you look great giving them out! 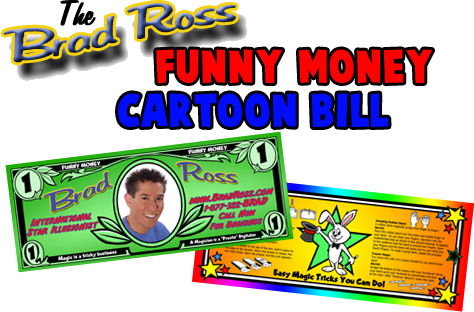 You’re giving them a cool dollar bill with magic tricks explained on them. 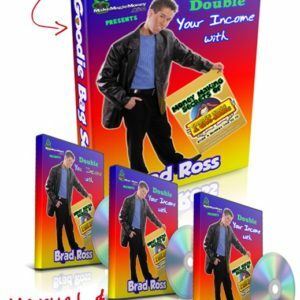 Of course, your photo (or caricature) is on the front, along with your sales pitch and contact information. How cool is that? Kids want to hang onto your promotional material!!! Over the years, there have been various designs.The original funny money was designed many years ago. When it got dated, answer version with a real dollar bill for the front and great tricks on the back came out. Now, it’s time to bring the idea into the 21st Century! When you pass these out, the kids will love you and everyone, including mom, will remember it!You get credit for passing out a really cool gift and they now know how to get in touch with you. You’re the guy with the giant dollar bill! I’m sure you’re wondering how much this is going to cost! 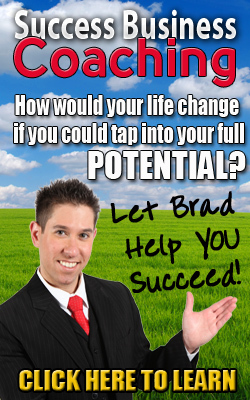 If you had a professional graphic artist design this, it would likely cost$350 or more. Considering how effective the giant magic bill is, this would still be a bargain, but I’m going to save you a bunch of money! I’ve done all the work and put together a package that you can’t pass up. I want this to be affordable for everyone! Since you are a MakeMagicMoney.com friend or subscriber, you will receive the following SPECIAL DEAL. You’ll get the super high-quality master files on CD. The PDF files can be used in Photoshop, Elements,Gimp.org, even in Microsoft Word or Publisher. Only your design skill limits what can be done with the empty spaces on the bill. Think of the bill as a template for you to add whatever promo info you desire. The files are PDFs of the front and back in full color and I give you the details on getting them printed. You receive the classic small bill to JUMBO bill instructions, template, routine as well as ideas for use in your birthday party shows. For a small additional fee, we CAN Customize YOUR Dollar if you DO NOT know how to use photoshop. We will add your name, phone number, website & your photo. The final version will be emailed to you.